As they often say - even the rich men cry, and even successful ones face failures. Well, it seems that Amazon is a vivid example of the market giant having a bad luck. After lasting for six years and collecting over two thousands of users around the world, Amazon Webstore has announced its shutdown on July 2016. Platform’s officials have notified e-merchants about the closing by e-mail, recommending to ensure their current store data security and, basically, to start looking for other suitable shopping carts. As many others, we’re sorry that such a promising Amazon’s creation didn’t live up to its maker’s expectations. However, we are sure that there are absolutely no reasons for Webstore users to fall into despair, as we’re already planning to add this eCommerce solution to our list of supported platforms. Since the powers of fierce competition are growing e-Commerce with a staggering speed, the market is now teeming with advanced and fairly cheap shopping carts, that are trying to outdo one another functionality-wise. Thus, the only hard challenge current e-merchants are facing, is to select the platform that suits their business needs the best, and is available for the most reasonable price. Then, after the choice is made, shop owners will just need to move store’s entities onto a desired solution, and when it comes to the matter of migrations - Cart2Cart is keen to help. Right at this moment we’re working on adding Amazon Webstore to our list of supported shopping carts, and we promise that you’ll be able to move data from this cart to any of the 60+ progressive solutions in the nearest future. So, stay in touch with our blog, and be the first to perform a switch from Amazon Webstore automatically, to give your business a brand-new chance for e-Commerce prosperity. P.S. 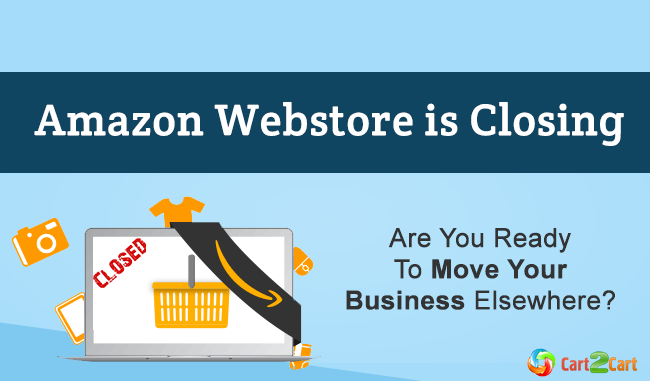 If you want to perform a migration from Amazon Webstore immediately - contact our Support Team - we’re ready to satisfy your needs straightaway.